The fifth season sports a new tagline: Destiny Calls. This apparently refers to the Oceanic 6 - Jack, Kate, Hurley, Sayid, Sun, and Aaron - who despite being rescued 108 days after the crash, heed their fate and return to the island. How this is possible, I don't know, because among other things, the island miraculously disappeared last season. The series trailer also shows Kate and Jack getting engaged (and married?) and raising Claire's son, Aaron. It looks like Jon Locke is alive and well even though he purportedly committed suicide last season (thank God... as a middle aged mamma, that dude is HOT!). And of course, the evil Ben is back another season to torture and manipulate everyone, especially Jack. Don't know about you, but when destiny calls, I answer. I'm even going to coerce my brother into getting my Tivo working so I don't miss a single episode (why doesn't ABC put Lost on OnDemand?!). When he comes over, maybe he'll lend me his Season 4 CDs - the set goes on sale December 9 just in time for Santa, of course - so I can rewatch last season and remember every significant - and insignificant - detail. Because honestly, how can you tell the difference? I am certainly glad "Lost" is now found. I'm looking to rediscovering that island - and taking a season-long vacation with the Oceanic 6 and the rest of the gang. I think you're hitting 50 a few months early, my sister, because you're forgetting a few things in your old age... At least half of those clips in the trailer are from previous seasons, and have already happened. Jack and Kate DID get engaged, but then Jack went off the deep end and hit the pills and booze after seeing his Dad's image in the hospital, and they had a fight because Kate was doing something (can't remember what myself at the moment) on Sawyer's behalf. 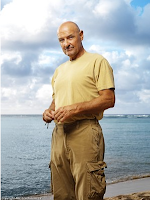 Locke may or may not be dead, depending on whether we're flashing forward or flashing back. It should still be a fun season, though! Well, all right... I told you I couldn't remember last season, especially now that Tom and I are four seasons deep into The Sopranos. But more importantly, when are you going to come over and fix my Tivo?? ?